Manufactured Gas Plants (MGPs) had their roots in the 1700s with the discovery that coal carbonization was a means of producing coal gas, which was subsequently used for illumination in many cities in England, Germany and the United States. 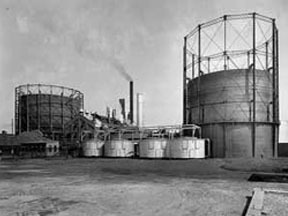 The first U.S. manufactured gas plant was opened in Baltimore in 1816. It is estimated that there were several thousand MGPs that operated in the U.S. between the early 1800’s and the 1970’s, when the last such sites were closed. The plants were closed as natural gas from pipelines became available in their service areas. The New York State Department of Environmental Conservation estimates that there were 300 sites with MGP operations in New York State alone. MGPs were sometimes referred to as "gasworks" or "town gas." From each plant, a network of underground pipes brought the gas into homes and businesses where it was used for lighting, cooking, and heating - the same purposes for which natural gas is used today. The first MGPs were constructed in the early 1800s, and by the mid to late 1800s production had greatly increased. Most New York State MGPs closed by 1950, with the last MGP in the state shutting down its operations in 1972. Two major types of waste materials are present at many MGP sites: coal tars and purifier waste. Coal tars are reddish brown, oily liquids which do not readily dissolve in water. Materials such as this are commonly referred to as a non-aqueous phase liquid, or NAPL. Although most tars are slightly more dense than water, the difference in density is slight. Consequently, they can either float or sink when in contact with water. Some underground tars move laterally away from the locations at which they were deposited. Near the ground surface, some of the tars may weather and partially solidify. Elsewhere, the tars retain their original, oily fluid properties and may still be capable of moving slowly through the subsurface. Purifier waste is a mixture of wood chips and iron filings which was used to remove sulfur and other compounds from the manufactured gas before the gas was distributed to the public. Purifier waste which was no longer capable of removing the impurities was often disposed of on site. The main categories of contaminants associated with MGP operations are volatile organic compounds and semivolatile organic compounds. The main volatile organic compound of concern in soil and groundwater is benzene. Specific semi-volatile organic compounds of concern in soil and groundwater are polycyclic aromatic hydrocarbons, referred to as PAHs. These are the compounds that make up tars and asphalt.